SPF and coatings over a smooth BUR roof system in Alexandria, VA. New skylights installed during application to improve warehouse lighting. SPF and coatings over a smooth BUR on a manufacturing plant in Lynchburg, VA.
Sprayed Polyurethane Foam (SPF) is a fully adhered, closed-cell roofing material providing a seamless, durable waterproof covering that bonds tightly to a properly prepared surface. The elimination of seams and joints eliminates the primary source of roof leaks. It is typically applied to a thickness of 1 to 2 inches to form a monolithic surface while incorporating flashings, penetrations and parapet walls. Independent studies prove SPF systems are highly dependable, long lasting, and very affordable. Many SPF roofs have been in place for more than 35 years—properly maintained, these roofs could last indefinitely. SPF’s aged insulating R-value of 6.5 per inch of thickness provides more thermal resistance with less material than any other type of roofing insulation. Because SPF is lightweight, it can be applied over most existing roof systems without exceeding the structural load capacity, and can be shaped or sloped as needed to improve roof drainage. SPF can be applied directly over single-ply, built up roofs, concrete, metal and wood substrates. 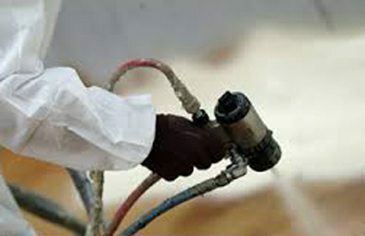 Consequently, there is rarely need for tear-off, reducing installation times, business disruption, roofing debris in landfills, and installation costs. PUFF foam and coating systems are energy-efficient, low maintenance and versatile roofing systems ideal for commercial, industrial and government roofing needs. Eliminates seams and joints – creates a monolithic membrane that eliminates the needs for mechanical fasteners. Can also be applied to walls and vertical surfaces. Creates proper drainage. By spraying directly to the roof surface, can vary thickness of foam, directing water-flow to drains. Minimizes standing water and roof leaks. With proper preparation, can be applied to almost any roof surface. 5-, 10-, 15- and 20-year full system warranties available. In many cases roofs can be recovered or repaired without tearing-off old surface thereby reducing waste and further overburdening landfills. Many of the elastomeric coatings are Energy Star® compliant and may have earned Cool Roof ratings due to their high reflectivity of harmful UV rays. Minimize energy consumption by controlling temperature extremes of heat loss and gain through the roof system. 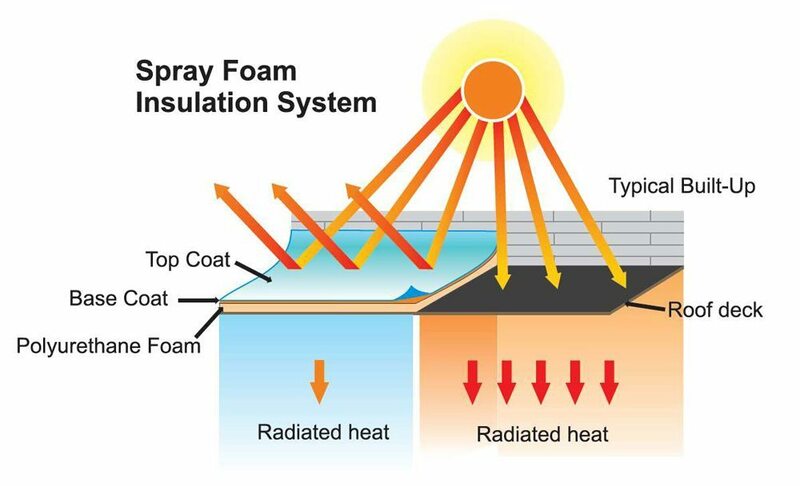 What is sprayed polyurethane foam (SPF)? SPF is a 2-part liquid, that is combined as it is spray applied. It expands up to 30 times its volume to form a monolithic, seamless, lightweight roof surface. 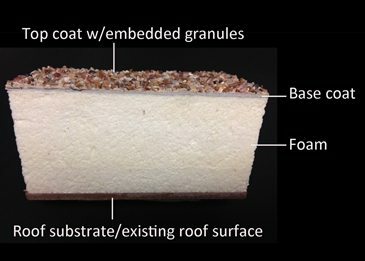 How long can a sprayed polyurethane foam (SPF) roof last? Depending on the thickness of the coating applied to the foam roof, roofing manufacturers offer warranties up to 20 years. With regular inspection and recoating after the term of the warranty, SPF roofs can last the lifetime of the building. Why are SPF roofs coated? SPF roofs are coated with an elastomeric coating over the water-resistant foam to protect against UV light and routine surface damage. Coatings increase the reflectivity of the roof, lowering heating and cooling costs. Can SPF roofs be recoated? Where can I use an SPF roofing system? SPF has excellent adhesion to a variety of substrates, including BUR, clay and concrete tile, shingles, metal, wood, concrete, single-ply, and modified roof systems. Since SPF adds little weight, it can be applied in varying thickness to add slope and fill in low areas. Can I walk on my SPF roof? Yes, it is strong enough to walk on. 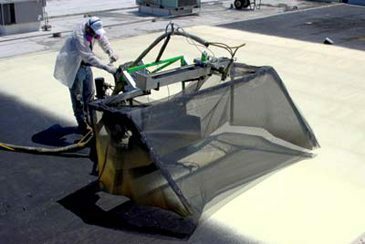 It is recommended that walk pads be installed in areas that need to be routinely serviced, to further protect the roof surface and embedded granules. Is SPF roofing a green product? Green building is the practice of creating structures and using processes that are environmentally responsible and resource-efficient throughout a building’s life-cycle. Green building, as it relates to SPF, is designed to reduce the impact on the environment by efficiently using energy, reducing waste and environmental degradation. By providing excellent insulating properties, SPF reduces energy usage; and because it can last the life of the building with proper maintenance and recoating, there is no need to tear off the entire roof and add to landfill waste. Leadership in Energy and Environmental Design is a certification program developed by the U.S. Green Building Council to provide standards for environmental-conscious and energy efficient best building practices. LEED provides a point system to score green building design and construction. LEED certification indicates points attained towards Certified, Silver, Gold and Platinum levels. Are SPF roofs LEED compliant? Many of PUFF’s suppliers offer LEED compliant products that we can incorporate into the building project.